(A) I used 1.4 g of fiber for Fritos based on my nutritional analysis below. (B) I calculated that there’s 1.34 grams of protein in Fritos, not 2 grams. If I’m right, then home made corn chips have 64% more protein. Calories matter. 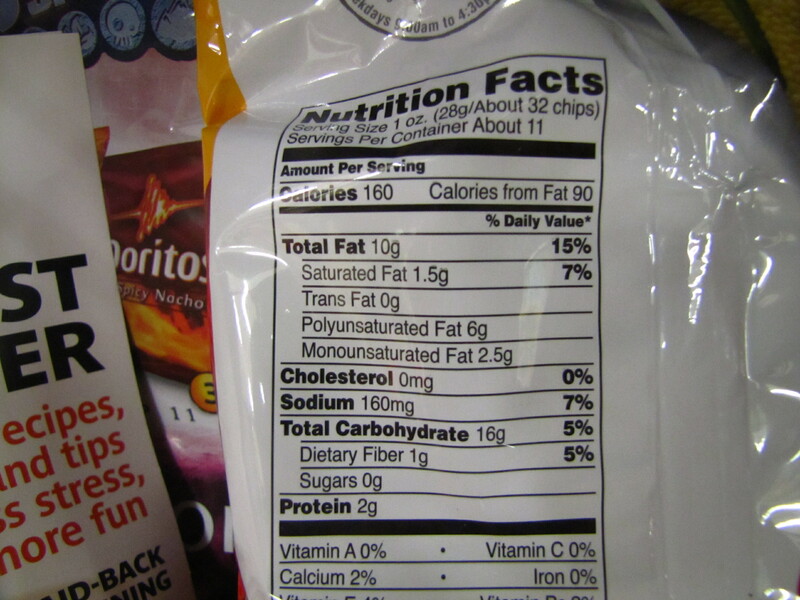 What make Fritos corn chips so bad is that they get over half their calories (56%) from fat (which has no protein, fiber, vitamins, or minerals). And if you buy a 3 ounce bag, are you really going to eat just 1 ounce? If you eat them all, that’s 480 calories, almost a quarter your total calories and half your fat for the day. Put another way, when you’re hungry and looking around the kitchen for something to eat, do you take a swig of corn oil? That’s what you’re doing when you eat corn or potato chips. I’ve got nothing against fat, it’s essential and tastes great. But if you’re going to eat a snack, wouldn’t you rather have nuts, ice cream, guacamole, or peanut butter, that not only taste good, but have redeeming nutritional value? Though you can have great tasting, healthy corn chips if you make them at home, and 4 ounces will only cost you about a quarter. I can’t figure out how to get the Frito Lay Original Corn Chips nutrition facts to match the official USDA nutrition amounts for 20016 Corn flour whole-grain yellow and 04518 Oil corn industrial and retail all purpose salad or cooking. I’ve written the USDA and FDA to ask how these calculations are made, which I’ll share with you if they write back. I also wrote Marion Nestle, a nutrition professor at New York University and author of many great books, including “What to Eat”. She told me “this happens due to rounding errors and errors in carbohydrate analysis”. Discrepancy #1: The label says that there are 2 grams of protein. By my calculations, there are 1.34 grams (see calculations below). Numbers below 1.49 should be rounded down to 1. And this was done for fiber, which is on the label with 1 gram (I calculated there were 1.41 grams of fiber). The serving size is 28 g (I’ll assume 28.35 since that’s what the USDA tables use). So you can see that it doesn’t add up to 28 because of rounding for half a gram (the other half gram probably represents the sugar, salt, and water in the corn flour). This could be easily fixed by having the nutrition facts have 1 decimal place, like the types of fat have. I guessed the wrong amounts of oil (9 g) and corn flour (19.35). Though other amounts make the discrepancies worse, because if there’s more oil (10 g) and less flour (18.35 g), then there are even more fat calories. I don’t understand how to calculate the amounts. Especially how to account for the grams of water in corn flour. When you bake, the finished product weighs less than the ingredients you used because the water is mostly removed. Below is what the FDA & USDA had to say. Nothing they said has changed my mind about being skeptical about nutrition facts labels. It’s best to think about how much you’re likely to eat or drink and then see if the serving size is tiny to trick you into thinking there aren’t many calories, and how much fat from calories there are, is there any fiber, and so on. Marion Nestle “What to Eat” has an excellent chapter on this. The FDA said they are not violating any regulations according to the FDA Food labeling Guide, and I am sure they aren’t! I just find the way the Nutrition Facts is calculated hard to figure out and was trying to get clarification. (FYI, here is a simple guide to the Nutrition Facts Panel). 1) Why is Fritos corn chips allowed to use the 19003 corn chips category, because 19003 has 147 calories and 8.5 grams fat, while Fritos has 160 calories and 10 grams of fat? 2) Why doesn’t Fritos use 20016 Corn flour whole-grain yellow and 04518 Oil corn industrial and retail all purpose salad or cooking to get the numbers right? could they have done that, or are they required to use 19003? 3) Since they cherry-picked the best values from 19003, why didn’t they also report their calories as 147 and 8.5 grams of fat? 4) Since their amount of oil is higher than 19003, and has less corn flour, the actual amount of protein is 1.34 grams, not the 1.71 in 19003. Using the 19003 value, they were able to round protein up to 2 grams, instead of rounding 1.34 DOWN to 1. 5) Can one decimal place be used on all the numbers? that would help a lot in making the totals add up, the rounding errors can be quite big. Aha! Manufacturers can use their OWN database and they don’t have to send it to the FDA!!! No wonder I couldn’t figure out why Fritos Original Corn Chips fiber and protein didn’t match the implied ratio of corn flour to oil. I assumed that they were using the official USDA database values, but they can use their own database if they like, which they don’t have to submit to the FDA! And the FDA recommends they calculate the nutrition by ingredient like I did, but that’s just a recommendation, manufacturers don’t have to do this. FDA’s continuing policy since the 1970s assigns the manufacturer the responsibility for assuring the validity of a product label’s stated nutrient values. Accordingly, the source of the data used to calculate nutrition label values is the prerogative of the manufacturer, but FDA’s policy recommends that the nutrient values for labeling be based on product composition, as determined by laboratory analysis of each nutrient. Submitting Data Bases to FDA is Voluntary. Although FDA encourages industry to submit nutrition labeling data bases to the agency for review, submission of a data base to FDA for the purpose of nutrition labeling is voluntary. The agency has not and does not intend to prescribe how an individual company is to determine nutrient content for labeling purposes. This entry was posted in Dishonest Labels, Nutrition and Cost, Outrageous! and tagged corn chip nutrition, crunch, fritos, nutrition fact label. Bookmark the permalink.